This article is about accession negotiations process. For the broad perspective on relations between the European Union and Turkey, see European Union–Turkey relations. Negotiations for full membership were started on 3 October 2005. Progress was slow, and out of the 35 Chapters necessary to complete the accession process only 16 had been opened and one had been closed by May 2016. The early 2016 refugee deal between Turkey and the European Union was intended to accelerate negotiations after previous stagnation and allow visa-free travel through Europe for Turks. Since 2016 accession negotiations have stalled. The EU has accused and criticized Turkey for human rights violations and deficits in rule of law. In 2017, EU officials expressed that planned Turkish policies violate the Copenhagen criteria of eligibility for an EU membership. On 26 June 2018, the EU's General Affairs Council stated that "the Council notes that Turkey has been moving further away from the European Union. Turkey’s accession negotiations have therefore effectively come to a standstill and no further chapters can be considered for opening or closing and no further work towards the modernisation of the EU-Turkey Customs Union is foreseen." Palace of Europe in Strasbourg, seat of the Council of Europe, which Turkey joined on 9 August 1949. After the Ottoman Empire's collapse following World War I, Turkish revolutionaries led by Mustafa Kemal Atatürk emerged victorious in the Turkish War of Independence, establishing the modern Turkish Republic as it exists today. Atatürk, President of Turkey, implemented a series of reforms, including secularisation and industrialisation, intended to "Europeanise" or Westernise the country. During World War II, Turkey remained neutral until February 1945, when it joined the Allies. The country took part in the Marshall Plan of 1947, became a member of the Council of Europe in 1949, and a member of NATO in 1952. During the Cold War, Turkey allied itself with the United States and Western Europe. The Turkish expert Meltem Ahıska outlines the Turkish position vis-à-vis Europe, explaining how “Europe has been an object of desire as well as a source of frustration for Turkish national identity in a long and strained history”. The country first applied for associate membership in the European Economic Community in 1959, and on 12 September 1963 signed the "Agreement Creating An Association Between The Republic of Turkey and the European Economic Community", also known as the Ankara Agreement. This agreement came into effect the following year on 12 December 1964. The Ankara Agreement sought to integrate Turkey into a customs union with the EEC whilst acknowledging the final goal of membership. In November 1970, a further protocol called the "Additional Protocol" established a timetable for the abolition of tariffs and quotas on goods traded between Turkey and the EEC. On 14 April 1987, Turkey submitted its application for formal membership into the European Economic Community. The European Commission responded in December 1989 by confirming Ankara's eventual membership but also by deferring the matter to more favourable times, citing Turkey's economic and political situation, as well its poor relations with Greece and the conflict with Cyprus as creating an unfavourable environment with which to begin negotiations. This position was confirmed again in the Luxembourg European Council of 1997 in which accession talks were started with central and eastern European states and Cyprus, but not Turkey. During the 1990s, Turkey proceeded with a closer integration with the European Union by agreeing to a customs union in 1995. Moreover, the Helsinki European Council of 1999 proved a milestone as the EU recognised Turkey as a candidate on equal footing with other potential candidates. The next significant step in Turkey–EU relations came with the December 2002 Copenhagen European Council. According to it, "the EU would open negotiations with Turkey 'without delay' if the European Council in December 2004, on the basis of a report and a recommendation from the Commission, decides that Turkey fulfills the Copenhagen political criteria." The European Commission recommended that the negotiations should begin in 2005, but also added various precautionary measures. The EU leaders agreed on 16 December 2004 to start accession negotiations with Turkey from 3 October 2005. While Austria and Germany initially wanted to leave open the possibility that negotiations with Turkey would lead to a privileged partnership, less than full membership, accession negotiations were ultimately launched with the "shared objective" of membership. Turkey's accession talks have since been stalled by a number of domestic and external problems. Both Austria and France have said they would hold a referendum on Turkey's accession. In the case of France, a change in its Constitution was made to impose such a referendum, but later another constitutional change has enabled the parliament (if a large majority of its members agrees) to prevent such a referendum. The issue of Cyprus continues to be a major obstacle to negotiations. European officials have commented on the slowdown in Turkish reforms which, combined with the Cyprus problem, led the EU's Enlargement Commissioner Olli Rehn in March 2007 to warn of an impending ‘train crash’ in the negotiations. Due to these setbacks, negotiations again came to a halt in December 2006, with the EU freezing talks in 8 of the 35 key areas under negotiation. In December 2009, the Republic of Cyprus blocked 6 chapters of Turkish accession negotiations, including those on Judiciary and Fundamental Rights, Energy and Education and Culture, arguing that Turkey needs to first normalise relations with Cyprus. As a result, no chapters have been opened since June 2010. Hence, there is no chapter Turkey can open other than the difficult and economically detrimental chapters Competition Policy, Social Policy and Employment, and Public Procurement that most candidate countries open at the end of accession as all other chapters are blocked. In February 2013, Turkish Deputy Undersecretary of the Ministry for EU Affairs, Burak Erdenir, claimed that the EU had yet to communicate to Turkey the benchmark criteria for opening chapters 23 and 24, Judiciary & Fundamental Rights and Justice, Freedom & Security, which was to be done after screening of the chapters was completed in 2006, thus making it impossible to comply with them. He also suggested this was a deliberate attempt to slow their accession process. After over 2 years of no chapter openings, the European Commission set up a "Positive agenda" designed to focus on common EU-Turkey interests. EU Commissioner for expansion Stefan Füle describes that the goal was "to keep the accession process alive and put it properly back on track after a period of stagnation which has been a source of frustration for both sides." The EU Commission mentioned a broad range of areas as the main elements of the Agenda such as “intensified dialogue and cooperation on political reforms”, “visa”, “mobility and migration”, “energy”, “fight against terrorism”, “further participation of Turkey in Community programmes”, “town twinning”, “trade and the Customs Union” and “supporting efforts to align with the acquis, including on chapters where accession negotiations cannot be opened for the time being”. The proposal was considered favorably on the condition that it serves as an instrument in support of and complementary to the negotiation process with the EU. In the framework of “Positive Agenda”, Working Groups were established on 8 chapters (“3-Right of Establishment and Freedom to Provide Services”, “6-Company Law”, “10-Information Society and Media”, “18-Statistics”, “23-Judiciary and Fundamental Rights”, “24-Justice, Freedom and Security”, “28-Consumer and Health Protection” and “32-Financial Control”). The “Positive Agenda” kick-off meeting was held on 17 May 2012 in Ankara with the participation of Stefan Füle, EU Commissioner for Enlargement and European Neighbourhood Policy. As a result of the Working Groups meetings held so far, a total of four closing benchmarks were confirmed to have been met by Turkey in three chapters (Company Law, Consumer and Health Protection and Financial Control chapters). In 2007, Turkey stated that they were aiming to comply with EU law by 2013, but Brussels refused to back that as a deadline for membership. In 2006 European Commission President José Manuel Barroso said that the accession process will take at least until 2021. In a visit to Germany on 31 October 2012, Turkish Prime Minister R.T. Erdoğan made clear that Turkey was expecting membership in the Union to be realised by 2023, the 100th Anniversary of the Turkish Republic, implying that they could end membership negotiations if the talks had not yielded a positive result by then. Turkish President Abdullah Gül said that upon completing the accession process Turkey will hold a referendum for Turkish membership in the European Union. On 20 June 2013, in the wake of Ankara's crackdown on mass demonstrations in Taksim Square, Germany blocked the start to new EU accession talks with Turkey. According to the Financial Times, one Turkish official said that such a move could potentially break off political relations with the bloc. A Eurobarometer poll which included EU countries and candidate countries as well, showed that 43% of Turks viewed the EU positively, as compared with 60% six months previously. In the same poll, 29% of Turks polled expressed support for an EU Constitution, the lowest level of support among EU countries and candidates polled. Germany says that its reservation stems from a technical issue, but Angela Merkel, an opponent of Turkish entry into the EU, has described herself as "shocked" after Ankara's use of overwhelming police force against mostly peaceful demonstrators. France stated that they would not waive their veto over unfreezing four accession chapters with Turkey until after elections for the European Parliament in June 2014. The crackdown following the 2016 Turkish coup d'état attempt by President Erdogan damaged relations with the EU. Erdogan has indicated his approval of reinstating the death penalty to punish those involved in the coup, with the EU suggesting that this would end its EU ambitions. Erdogan stated in November 2016 that he was considering putting Turkey's continued negotiations with the EU on membership to a referendum in 2017. In November 2016, the European Parliament voted in favour of a non-binding resolution to request that the European Commission temporarily suspend membership negotiations due to the "disproportionate repressive measures" of the government to the coup. On 13 December, the European Council (comprising the heads of state or government of the member states) resolved that it would open no new areas in Turkey's membership talks in the "prevailing circumstances"; Turkey's path toward autocratic rule makes progress on EU accession impossible. In 2017, EU officials expressed that planned Turkish policies violate the Copenhagen criteria of eligibility for an EU membership. In April 2017, the Parliamentary Assembly of the Council of Europe (PACE) voted to reopen its monitoring procedure against Turkey. This vote is widely understood to deal a major blow to Turkey's perspective of eventual EU membership, as exiting that process was made a precondition of EU accession negotiations back in 2004. The European Commission's long-term budget proposal for the 2021-2027 period released in May 2018 included pre-accession funding for a Western Balkan Strategy for further enlargement, but omitted Turkey. On 26 June 2018, the EU's General Affairs Council stated that "the Council notes that Turkey has been moving further away from the European Union. Turkey’s accession negotiations have therefore effectively come to a standstill and no further chapters can be considered for opening or closing and no further work towards the modernisation of the EU-Turkey Customs Union is foreseen." The Council added that it is "especially concerned about the continuing and deeply worrying backsliding on the rule of law and on fundamental rights including the freedom of expression." 31 July 1959 – Turkey applies for associate membership in the European Economic Community. 12 September 1963 – Association Agreement signed, acknowledging the final goal of membership. 1 December 1964 – Association Agreement comes into effect. 23 November 1970 – Protocol signed providing a timetable for the abolition of tariffs and quotas on goods. 1980 – Freeze in relations following the 1980 Turkish coup d'état. 1983 – Relations fully restored following elections. 14 April 1987 – Application for formal membership into the European Community. 18 December 1989 – European Commission refuses to immediately begin accession negotiations, citing Turkey’s economic and political situation, poor relations with Greece and their conflict with Cyprus, but overall reaffirming eventual membership as the goal. 6 March 1995 – European Union-Turkey Customs Union is formed. 12 December 1999 – European Council recognises Turkey as a candidate on equal footing with other potential candidates. 12 December 2002 – European Council states that "the EU would open negotiations with Turkey 'without delay' if Turkey fulfills the Copenhagen criteria." 24 April 2004 – Turkey and the Turkish Republic of Northern Cyprus back the Annan Plan for Cyprus. 17 December 2004 – European Union agrees to start negotiations. 20 October 2005 – Screening started. 12 June 2006 – Chapter on "Science & Research" is opened and closed. 13 October 2006 – Screening completed. 11 December 2006 – Continued dispute over Cyprus prompts the EU to freeze talks on 8 chapters and state that no chapters would be closed until a resolution is found. 29 March 2007 – Chapter on "Enterprise & Industrial Policy" is opened. 25 June 2007 – Chapter on "Statistics & Financial Control" is opened, but the opening of the chapter on "Economic & Monetary Policy" was blocked by French President Nicolas Sarkozy. 26 July 2007 – Chapter on "Financial Control" is opened. 19 December 2007 – Chapters on "Health & Consumer Protection" and "Trans-European Networks" are opened. 17 June 2008 – Chapters on "Company Law" and "Intellectual Property Law" are opened. 19 December 2008 – Chapters on "Free Movement of Capital" and "Information Society & Media" are opened. 30 June 2009 – Chapter on "Taxation" is opened. 21 December 2009 – Chapter on "Environment & Climate Change" is opened. 30 June 2010 – Chapter on "Food Safety, Veterinary & Phytosanitary Policy" is opened. 17 May 2012 – Launch of the "Positive Agenda" with Turkey. 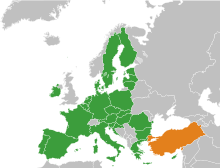 1 July 2012 – 31 December 2012 – Turkey freezes relations with the European Union for the duration of Republic of Cyprus' rotating presidency. 12 February 2013 – France's foreign minister Laurent Fabius announces that France has officially removed its veto over Chapter 22 ("Regional Policy & Coordination of Structural Instruments"), and will assist in the chapter's opening. This chapter is also unfrozen on this date. 25 June 2013 – Chapter on "Regional Policy & Coordination of Structural Instruments" is partially opened, but negotiations on the chapter will not commence until after the annual Progress Report is published in October, due to Turkey's handling of protesters. 5 November 2013 – Chapter on Regional Policy & Coordination of Structural Instruments is fully opened. 16 December 2013 – The EU launches the Visa Liberalisation Dialogue with Turkey. 31 January 2014 – France officially removes its veto over Chapter 11 ("Agriculture & Rural Development"). This chapter was blocked by both Cyprus and France, so it can't be unfrozen until Cyprus removes its veto. 29 November 2015 – At the EU-Turkey Summit the EU welcomes Turkey's commitment to accelerate the fulfilment of the Visa Roadmap benchmarks in return for halting the flow of Syrian refugees from Turkey to Greece. 1 December 2015 – France officially removes its veto over Chapter 17 ("Economic & Monetary Policy"). 14 December 2015 – Chapter on "Economic & Monetary Policy" unfrozen and opened. 18 March 2016 – France officially removes its veto over Chapter 33 ("Financial & Budgetary Provisions"). This chapter is also unfrozen on this date. 30 June 2016 – Chapter on "Financial & Budgetary Provisions" is opened. 24 November 2016 – MEPs vote overwhelmingly to suspend negotiations with Turkey over human rights and rule of law concerns. 20 February 2019 - EU parliament committee votes to suspend accession talks with Turkey. To accede to the EU, Turkey must successfully complete negotiations with the European Commission on 33 of the 35 chapters of the acquis communautaire, the total body of EU law. (Two chapters do not require negotiation.) Afterwards, the member states must unanimously agree on granting Turkey membership to the European Union. ^ a b c d e f Some of the chapters do not proceed to the next stage in the process, because they are blocked by Cyprus. ^ a b c d France blocked some chapters from proceeding to the next stage of the process, but subsequently lifted their veto. Until the accession process is terminated, Turkey receives payments from the EU budget as pre-accession support, currently 4.5 billion allocated budget for the 2014–2020 period (about 740 million Euros per year). In June 2017, the EU's financial watchdog, the European Court of Auditors, announced that it would investigate the effectiveness of the pre-accessions funds which Turkey has received since 2007 to support rule of law, civil society, fundamental rights, democracy and governance reforms. Turkish media commented that "perhaps it can explain why this money apparently failed to have the slightest effect on efforts to prevent the deterioration of democracy in this country." The problem of Turkey's membership of the EU is compounded by conflicting views as to what the EU should ultimately become. This has played a significant role in the debate, due in part to the Eurozone crisis and the fact that as a result of this the eurozone and the EU overall is more federalised on both fiscal, legal and political levels than it was at the time of Turkey's application or at the time that Turkey was accepted as a candidate. Generally those members of the EU who support a rights-based free trade bloc do not oppose Turkey as adamantly as those who support a broader political union. The latter, in particular, are concerned that unification would be frustrated and the European project threatened by Turkey's inclusion. With destinations in 126 countries worldwide, Turkish Airlines is the largest carrier in the world by number of countries served as of 2016[update]. Proponents of Turkey's membership argue that it is a key regional power with a large economy and the second-largest military force of NATO after the United States that will enhance the EU's position as a global geostrategic player and its Common Foreign and Security Policy; given Turkey's geographic location and economic, political, cultural and historic ties in regions with large natural resources that are at the immediate vicinity of the EU's geopolitical sphere of influence; such as the East Mediterranean and Black Sea coasts, the Middle East, the Caspian Sea basin and Central Asia. According to the former Swedish foreign minister, Carl Bildt, "the accession of Turkey would give the EU a decisive role for stability in the eastern part of the Mediterranean and the Black Sea, which is clearly in the strategic interest of Europe". Two of Turkey's key supporters for its bid to join the EU are Poland and the United Kingdom. Upon joining the EU, Turkey's 76 million inhabitants would bestow the second-largest number of MEPs in the European Parliament. Demographic projections indicate that Turkey would surpass Germany by 2020. However, as a single country can only hold a maximum of 96 seats in the European Parliament, this would not give Turkey an advantage in the European Parliament. The Nabucco, TANAP, TAP and ITGI pipelines will deliver natural gas from the Caspian Sea basin to the EU member states. The Turkish high-speed railway network and the Marmaray tunnel will improve trade and commerce between the EU and Turkey. Turkey's membership would also affect future enlargement plans, especially the number of nations seeking EU membership, grounds on which Valéry Giscard d'Estaing has opposed Turkey's admission. Giscard has suggested that it would lead to demands for accession by Morocco. Morocco's application is already rejected on geographic grounds; Turkey, unlike Morocco, has 3% of its territory in Europe. The vast majority of its population lives in the Asian side of the country. On the other hand, the country's largest city, Istanbul, lies mostly in Europe. On the other hand, Cyprus, which is geographically located in Asia, joined the European Union in 2004. Former French President Nicolas Sarkozy stated in January 2007 that "enlarging Europe with no limit risks destroying European political union, and that I do not accept ... I want to say that Europe must give itself borders, that not all countries have a vocation to become members of Europe, beginning with Turkey which has no place inside the European Union." EU member states must unanimously agree on Turkey's membership for the Turkish accession to be successful. In December 2011, a poll showed that as much as 71% of the participants surveyed in Austria, the Czech Republic, France, Germany, Italy, Poland, Spain and the United Kingdom were opposed to Turkey's membership in the European Union. A number of nations may oppose it; notably Austria; Germany (chancellor Angela Merkel has long rejected Turkey's accession bid, and has proposed a "privileged partnership" instead); and France (where some[who?] are anxious at the prospect of a new wave of Muslim immigrants, given the country's already large Muslim community). Negotiations to remove the French constitutional requirement for a compulsory referendum on all EU accessions after Croatia resulted in a new proposal to require a compulsory referendum on the accession of any country with a population of more than 5% of the EU's total population; this clause would mainly apply to Turkey and Ukraine. The French Senate, however, blocked the change in the French constitution, in order to maintain good relations with Turkey. The current situation according to the French constitution is as follows: if ​3⁄5 of the delegates (from the Senate and the Parliament) agree to the accession of Turkey, there will be no referendum. Panoramic view of the Bosphorus strait, with the Fatih Sultan Mehmet Bridge at right. Marmaris on the Turquoise Coast of Turkey, which is famous for its Blue Cruise voyages with gulet type schooners. Upon accession to the EU, Turkey expects to receive economic development aid similar to what Ireland, Greece and Portugal received. There is also an expectation that there will be an increase in European foreign investment in the Turkish economy, further driving economic growth. Additionally, in times of economic crisis, Turkey could expect economic assistance from the EU, similar to what Ireland, Greece and Portugal received after the 2008 financial crisis. Free movement of people across the EU will give many Turkish people the opportunity to easily migrate to other parts of Europe in search of work, or a higher standard of living. The option of migration out of Turkey will inevitably ease tensions in the east of the country, as the prospect of a better standard of living will tend to cool separatist tendencies. Some secularists in Turkey envisage that the accession of Turkey will contribute to the spread of secular western values in Turkey. Conversely, some non-secularists in Turkey envisage that accession will contribute to the further growth and acceptance of Islam in Europe. The EU accession bid has stimulated Turkey's political and legal reforms and intensified the democratisation process. Given Turkey's large and growing population, Turkey will have a correspondingly large representation in the European Parliament. This will give Turkey strong direct influence over EU policies. Membership in the EU will also increase Turkey's prestige regionally and internationally. A view of Dolmabahçe Palace and the skyline of Levent business district from the Bosphorus strait in Istanbul, the largest city and economic capital of Turkey, and the former capital of the Roman (330–395), Byzantine (395–1204 and 1261–1453), Latin (1204–1261) and Ottoman (1453–1922) Empires. Turkey has the world's 17th largest GDP-PPP and 18th largest Nominal GDP. The country is a founding member of the OECD and the G-20 major economies. Turkey has taken advantage of a customs union with the European Union, signed in 1995, to increase its industrial production destined for exports, while at the same time benefiting from EU-origin foreign investment into the country. In 2008, Turkey's exports reached 141.8 billion USD (main export partners: Germany 11.2%, UK 8%, Italy 6.95%, France 5.6%, Spain 4.3%, US 3.88%; total EU exports 56.5%.) However, larger imports amounting to about 204.8 billion USD threaten the balance of trade (main import partners: Russia 13.8%, Germany 10.3%, China 7.8%, Italy 6%, USA 4.8%, France 4.6%, Iran 3.9%, UK 3.2%; total EU imports 40.4%; total Asia imports 27%). According to Forbes magazine, Istanbul had a total of 37 billionaires in 2013, ranking 5th in the world behind Moscow (84 billionaires), New York City (62 billionaires), Hong Kong (43 billionaires) and London (43 billionaires). The opening of talks regarding the Economic and Monetary Policy acquis chapter of Turkey's accession bid was expected to begin in June 2007, but were stalled by France. Turkey became the European Union's fifth-largest trade partner in 2015 according to data released by Eurostat. Turkey is set to receive EUR 9.2bn from the Instrument for Pre-Accession Assistance, a funding mechanism for EU candidate countries. İstiklal Avenue in Istanbul's cosmopolitan Beyoğlu district is visited by an average of 3 million people on weekend days. As of 2005[update], the population of Turkey stood at 71.5 million with a yearly growth rate of 1.5%. The Turkish population is relatively young, with 25.5% falling within the 0–15 age bracket. If Turkey were to join the European Union, Istanbul would become the most populous metropolis in the EU. Cyprus was divided when, on 20 July 1974, Turkey invaded and occupied a third of the island in response to an Athens-engineered coup aimed at annexing Cyprus to Greece. Since then, Turkey has refused to acknowledge the Republic of Cyprus (an EU member since 2004) as the sole authority on the island, and recognizes the self-declared Turkish Republic of Northern Cyprus since its establishment in 1983. The Turkish invasion in 1974 and the resulting movement of refugees along both sides of the Green Line, and the establishment of the self-declared Turkish Republic of Northern Cyprus in 1983, form the core issues which surround the ongoing Cyprus dispute. Turkey and the Turkish Cypriots backed the 2004 Annan Plan for Cyprus aimed at the reunification of the island, but the plan was subsequently rejected by Greek Cypriots on the grounds that it did not meet their needs. According to Greek Cypriots, the latest proposal included maintained residence rights for the many Anatolian Turks who moved to Cyprus after the invasion (and their descendants who were born on the island after 1974), while the Greek Cypriots who lost their property after the Turkish invasion would be granted only a restricted right of return to the north following the island's proposed reunification. Although the outcome received much criticism in the EU as well, the Republic of Cyprus was admitted into the EU a week after the referendum. The self-declared Turkish Republic of Northern Cyprus has been recognised only by Turkey since its establishment in 1983. In 2004, the Parliamentary Assembly of the Council of Europe (PACE) gave observer status (without voting rights) to the representatives of the Turkish Cypriot community. The Turkish government has refused to officially recognise the Republic of Cyprus until the removal of the political and economic blockade on the Turkish Republic of Northern Cyprus. Turkey's non-recognition of the Republic of Cyprus has led to complications within the Customs Union. Under the customs agreements which Turkey had already signed as a precondition to start EU membership negotiations in 2005, it is obliged to open its ports to Cypriot planes and vessels, but Turkey has not complied so far; refusing to do so until the EU eases the international isolation of Northern Cyprus. In February 2013, Turkish EU Minister Egemen Bağış told the Republic of Cyprus, "if you truly want salvation, truly want peace, then remove your blockade of Ercan Airport to EU member countries and Turkey will open its ports to you." Turkey's refusal to implement a trade pact between Turkey and the EU that requires the Turkish government to allow Greek Cypriot vessels to use its air and sea ports has prompted the EU to freeze eight chapters in Turkey's accession talks. In November 2009, Turkish Deputy Prime Minister Cemil Çiçek declared that, should Turkey be forced to choose between supporting either EU membership or Turkish Cypriots, "[then] Turkey’s choice will forever be to stand next to the Turkish Cypriots. Everybody should understand this." The issue of Turkish membership has been contentious in Greece. An opinion poll from 2005 suggested that only 25% of Greeks believe Turkey has a place in the European Union. The former Greek Prime Minister Kostas Karamanlis stated that Turkish membership of the EU could only be predicated upon, "full compliance, full accession" in December 2006. In 2005 the European Commission referred to relations between Turkey and Greece as "continuing to develop positively" while also citing a key barrier to progress being Turkey's ongoing claim of casus belli over a dispute about territorial waters boundaries. In September 2017, Greek Prime Minister, Alexis Tsipras, mentioned that halting accession talks with Turkey would be a strategic mistake by the European Union, amid a war of words raging between Germany and Turkey. Also, former Greek Prime Minister, George Papandreou, has urged European Union leaders to keep the doors open to Turkey and to continue dialogue with the Turkish government, in an apparent reference to German Chancellor Angela Merkel's calls for the suspension of accession talks with Turkey. Originally a church, later a mosque, and today (since 1935) a museum, the 6th century Hagia Sophia (532–537) in Constantinople (Istanbul) built by the Byzantine emperor Justinian the Great was the largest cathedral ever constructed in the world for nearly a millennium, until the completion of the Seville Cathedral (1507) in Spain. Turkey has a secular constitution, with no "official" state religion, although the chief imam (currently Mehmet Görmez) is a civil servant and head of the Religious Affairs Directorate, or Diyanet. 82% of the Turkish population is Muslim of whom over 70% belong to the Sunni branch of Islam. A minority is affiliated with the Shi'a Alevi branch. Turkey would be the first Muslim-majority country to join the European Union. Official population census polls in Turkey do not include information regarding a person's religious belief or ethnic background due to the regulations set by the Turkish constitution, which defines all citizens of the Republic of Turkey as Turkish in terms of nationality, regardless of faith or race. There is a tradition of secularism in Turkey. The state has no official religion nor promotes any, and actively monitors the area between the religions. The constitution recognises the freedom of religion for individuals, whereas religious communities are placed under the protection of the state; but the constitution explicitly states that they cannot become involved in the political process (by forming a religious party, for instance) or establish faith-based schools. No party can claim that it represents a form of religious belief; nevertheless, religious sensibilities are generally represented through conservative parties. Turkey prohibits by law the wearing of religious headcover and theo-political symbolic garments for both sexes in government buildings, schools, and universities; the law was upheld by the Grand Chamber of the European Court of Human Rights as legitimate in the Leyla Şahin v. Turkey case on 10 November 2005. However, in 2010, the prohibition of wearing headscarfs in universities was lifted. Cultural differences between Muslim majority Turkey and predominantly Christian Europe play an important part in the entire debate on Turkish accession to the European Union. In an analysis, based on the World Values Survey, the social scientists Arno Tausch and Almas Heshmati came to the conclusion that a robust measurement scale of global economic, political and social values and Turkey's place on them wields only a very qualified picture of Turkey's place on the maps of global values. The study, which is based on 92,289 representative individuals with complete data in 68 countries, representing 56.89% of the global population, looks at hard-core economic values in the countries concerned. From nine dimensions for the determination of the geography of human values, based on a promax factor analysis of the available data, six factor analytical scores to calculate a new Global Value Development Index were used, which combines: avoiding economic permissiveness; avoiding racism; avoiding distrust of the army and the press; avoiding the authoritarian character; tolerance and respect; and avoiding the rejection of the market economy and democracy. Turkey is ranked 25, ahead of several EU member countries. But there are still considerable deficits concerning the liberal values components, which are very important for an effective democracy. The deficits, the study argues, suggest that the Turkish state, Turkish civil society and European decision makers would be well advised to continue to support civil society and secular democracy in Turkey. In 2004, the French Foreign Minister Michel Barnier stated that Turkey must recognise the systematic massacres of Armenians in 1915 as a genocide. However, he insisted that although France did not set a precondition for European Union entry regarding the matter, he stated that France would raise the issue during negotiations. The President of the European Parliament, Martin Schulz, stated that it must be a precondition for Turkey to recognise the systematic massacres of Armenians in 1915 as genocide. The government of Turkey rejects such a precondition for EU membership and does not accept it as a part of the EU membership criteria. In 2006, the European Parliament voted against a proposal to formally add the issue as a membership criterion for Turkey. A similar proposal by Greek and Greek Cypriot MEPs was also rejected by the European Parliament in 2011. In 2013, during the case of Perinçek v. Switzerland, the European Court of Human Rights judged that "The existence of a genocide, which was a precisely defined legal concept, was not easy to prove. The Court doubted that there could be a general consensus as to events such as those at issue, given that historical research was by definition open to discussion and a matter of debate, without necessarily giving rise to final conclusions or to the assertion of objective and absolute truths." In contravention of European Union directives on human rights, Turkey banned LGBT pride parades in 2015 and 2016. Reasons given for the ban were security concerns, and religious sensitivities caused by holding the parade during the month of Ramadan. Article 301 states that "a person who publicly insults the Turkish nation, the State of the Republic of Turkey, or the Grand National Assembly of Turkey, shall be punishable by imprisonment of between six months and two years" and also that "expressions of thought intended to criticise shall not constitute a crime." The EU was especially critical of this law during the September 2005 trial of novelist Orhan Pamuk over comments that recognised the deaths of thirty thousand Kurds and a million Armenians. Enlargement commissioner Olli Rehn and members of the European Parliament called the case "regrettable", "most unfortunate", and "unacceptable". After the case was dropped three months later, Turkey's Foreign Minister Abdullah Gül indicated that Turkey may abandon or modify Article 301, stating that "there may be need for a new law". In September 2006, the European Parliament called for the abolition of laws, such as Article 301, "which threaten European free speech norms". On 30 April 2008, the law was reformed. According to the reform, it is now a crime to explicitly insult the "Turkish nation" rather than "Turkishness"; opening court cases based on Article 301 require the approval of the Justice Minister; and the maximum punishment has been reduced to two years in jail. Kemal Kerinçsiz, an ultra-nationalist lawyer, and other members of Büyük Hukukçular Birliği (Great Jurists Union) headed by Kerinçsiz, have been "behind nearly all of [Article 301] trials." In January 2008, Kerinçsiz was arrested for participating in an ultra-nationalist underground organisation, Ergenekon, allegedly behind the attacks on the Turkish Council of State and Cumhuriyet newspaper, the assassination of several Christian missionaries and Armenian-Turkish journalist Hrant Dink, as well as allegedly plotting the assassination of Nobel laureate Orhan Pamuk. 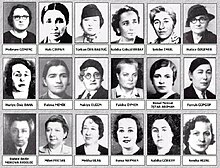 Eighteen female MPs joined the Turkish Parliament with the 1935 general elections, at a time when women in a significant number of other European countries had voting rights for the local municipal elections, but not for the national parliamentary elections. In 1993 Tansu Çiller became the first female Prime Minister of Turkey. Turkey gave women the right to vote in 1930 for municipal elections. In 1934 this right was expanded for the national elections, while women were also given the right to become elected as MPs in the Turkish Parliament, or for being appointed as Ministers, Prime Minister, Speaker of the Parliament and President of the Republic. In 1993 Tansu Çiller became the first female Prime Minister of Turkey. In its second report on women's role in social, economic and political life in Turkey, the European Parliament emphasised that respecting human rights, including women's rights, is an essential condition for Turkey's membership of the EU. According to the report, Turkey's legal framework on women's rights "has in general been satisfactory, but its substantive implementation remains flawed." Turkey is one of two states (along with Azerbaijan) among the 47 members of the Council of Europe which refuse to recognise the status of conscientious objectors or give them an alternative to military service. Public opinion in EU countries generally opposes Turkish membership, though with varying degrees of intensity. The Eurobarometer September–October 2006 survey shows that 59% of EU-27 citizens are against Turkey joining the EU, while only about 28% are in favour. Nearly all citizens (about 9 in 10) expressed concerns about human rights as the leading cause. In the earlier March–May 2006 Eurobarometer, citizens from the new member states were more in favour of Turkey joining (44% in favour) than the old EU-15 (38% in favour). At the time of the survey, the country whose population most strongly opposed Turkish membership was Austria (con: 81%), while Romania was most in favour of the accession (pro: 66%). On a wider political scope, the highest support comes from the Turkish Cypriot Community (pro: 67%) (which is not recognised as a sovereign state and is de facto not EU territory and out of the European institutions). These communities are even more in favour of the accession than the Turkish populace itself (pro: 54%). Opposition in Denmark to Turkish membership was polled at 60% in October 2007, despite the Danish government's support for Turkey's EU bid. The opening of membership talks with the EU in December 2004 was celebrated by Turkey with much fanfare, but the Turkish populace has become increasingly sceptical as negotiations are delayed based on what it views as lukewarm support for its accession to the EU and alleged double standards in its negotiations particularly with regard to the French and Austrian referendums. A mid-2006 Eurobarometer survey revealed that 43% of Turkish citizens view the EU positively; just 35% trust the EU, 45% support enlargement and just 29% support an EU constitution. Moreover, Turks are divided on whether to join at all. A 2007 poll put Turkish support for accession to the EU at 41.9% (up from 32% in 2006), with 27.7% opposed and 24.0% indifferent. A 2009 poll showed that support for accession had risen to 48%, even as negative views of the EU had risen from 28% to 32%. A 2013 poll showed Turkish support for the EU bid at one third of the population, and opposition to double that share. According to the Transatlantic Trends survey for 2013, 60% of Turks have an unfavourable view of the European Union and most Turks believe that working with Asia is more important to their national interests than working with Europe. 44% of Turks believe EU membership could be good for the economy in contrast with 61% for EU citizens. During an interview with Euractiv, EU Minister Egemen Bağış stated that: "This is what Europe needs to do; they need to say that when Turkey fulfills all requirements, Turkey will become a member of the EU on date X. Then, we will regain the Turkish public opinion support in one day." "... under my Presidency of the Commission ... no further enlargement will take place over the next five years. As regards Turkey, the country is clearly far away from EU membership. A government that blocks Twitter is certainly not ready for accession." Primary reasons for Turkey's persistent requests to join the EU are, among others, the many Turks in Europe and the importance of trade between the two. Turkey is, however, also increasingly disappointed with the widespread opposition to its accession among EU member states. In September 2012, Turkish Prime Minister Erdoğan was asked by CNN if Turkey still wants to join the EU. His response: "There are 5 million Turks in Europe and 3 million Turks in Germany alone. We are a natural member of the European Union. Germany invited Turkish workers 50 years ago, however 50 years have passed and we have waited at the European Union's doorstep. No other country has experienced such a thing. We will be patient until a point. However, when we cross that point, we will bring light to the situation and decide accordingly." During a trip to Yalta, Erdoğan expressed his stern disappointment regarding the EU accession process: "We are still an EU negotiating candidate. At such a position, I wish EU accession. Otherwise, such a scenario would affect a large region including Ukraine and Turkey." German chancellor Angela Merkel has repeatedly opposed full membership of Turkey to the EU on German-Turkish summits, advocating instead a privileged partnership. Some Christian Democrats back fuller support for Turkey, risking the chancellor becoming more isolated in advocating for a "privileged partnership". In September 2011, on the occasion of the visit of the Turkish president Gül, Merkel said: "We don't want the full membership of Turkey. But we don't want to lose Turkey as an important country", referring to her idea of a strategic partnership. In 2006, Chancellor Merkel said "Turkey could be in deep, deep trouble when it comes to its aspirations to join the European Union" regarding its refusal to open up its ports to European Union member Cyprus. Again in 2014, when Erdogan urged Merkel to strongly support his country's bid, there was no sign the chancellor had relinquished her skepticism. She revealed after the two had talked: "I personally said that we are in a negotiation process that has certain outcome and no fixed time frame. It is no secret and nothing has changed in my view that I am sceptical about full membership for Turkey." In a TV debate in September 2017, German chancellor Angela Merkel and her challenger Martin Schulz both said that they would seek an end to Turkey's membership talks with the European Union. Former French President Nicolas Sarkozy opposed the entrance of Turkey in the European Union, arguing the country was too big, too poor and too culturally different to join the EU. Former President Francois Hollande, however, reaffirmed support for Turkey in 2012, intending to smooth the way for French companies seeking contracts in Turkey. Franco-Turkish relations remained tense after Turkey imposed a law in 2009 that criminalised recognition of the killing of Armenians by Ottoman Turks in 1915 as a genocide; a move France's Constitutional Court reversed,[clarification needed] in turn causing French firms' share of foreign investment in Turkey to shrink from 6% in 2009 to 3% in 2012. Leaders of French infrastructure companies are especially eager to enter the Turkish markets for nuclear security and rail infrastructure, expected to respectively be worth $40 and $50 billion by 2020. In September 1999, following a thaw in Greek-Turkish relations after mutual help in earthquake relief, Greek Foreign Minister George Papandreou told The Guardian "Greece not only wants to see Turkey in the EU, it wants to be pulling the cart of a European Turkey", and that it was within his nation's interests as a way to avoid "continual conflict and tension with the block and European standards". The 2005 EU Progress Report stated that: "On 29 July 2005, Turkey signed the Additional Protocol adapting the EC Turkey Association Agreement to the accession of 10 new countries on 1 May 2004. At the same time, Turkey issued a declaration stating that signature of the Additional Protocol did not amount to recognition of the Republic of Cyprus. On 21 September, the EU adopted a counter-declaration indicating that Turkey’s declaration was unilateral, did not form part of the Protocol and had no legal effect on Turkey’s obligations under the Protocol. The EU declaration stressed that recognition of all Member States was a necessary component of the accession process. It also underlined the need for supporting the efforts of the Secretary General of the UN to bring about a comprehensive settlement of the Cyprus problem which would contribute to peace, stability and harmonious relations in the region." In November 2006, the European Commission members decided to suspend parts of the talks with Turkey regarding accession, as Turkish officials said that they will not open Turkish ports to traffic from Republic of Cyprus until the EU eases its embargo on Turkish-controlled northern Cyprus. In 2007, European Commission President José Manuel Barroso said that Turkey is not ready to join the EU "tomorrow nor the day after tomorrow", but its membership negotiations should continue. He also called on France and other member states to honour the decision to continue accession talks, describing it as a matter of credibility for the Union. On 28 June 2007, Portuguese State Secretary for European Affairs Manuel Lobo Antunes affirmed that "Turkey should join the EU once it has successfully completed membership talks, which are likely to run for at least a decade." "We think it is important and fundamental that Turkey joins the European Union once it fulfils all the conditions and all the criteria," he said, adding that "Portugal aims in the next six months to 'put the process on track'." On 5 November 2008, the Italian Foreign Minister Franco Frattini declared that "the Italian government will support the inclusion of Turkey in the European Union with all its strength." He indicated that "the Italian Parliament will give a 'clear word' when necessary with the 'enormous majority' of the Berlusconi government, but also with 'the opposition' which it knows it can count on." "Turkey's inclusion will not be a problem, but it will be part of the solution for strengthening Europe in relations with other countries, such as the Caucasus region" he added. On 13 November 2008, the Italian Prime Minister Silvio Berlusconi urged the EU to "accelerate Turkey's membership bid" and pledged to "help Ankara gain accession." Berlusconi pledged to "try and win over those EU members resistant to Turkey’s application." "Regarding the opposition shown by certain countries – some of which are important countries – I am confident we will be able to convince them of the strategic importance of Turkey, within the European framework, as a country bordering the Middle East," Berlusconi declared. On 5 April 2009, Spanish Prime Minister José Luis Rodríguez Zapatero stated that "Spain firmly supports Turkey’s candidature to enter the EU, provided it meets the necessary requisites." Zapatero told Turkish Prime Minister Recep Tayyip Erdoğan that "Spain’s position is 'firm, clear and solid' in favour of Turkey’s candidature to enter the European Union." "We must 'open the door' for Turkey to enter 'the EU peace and cooperation project', provided it meets the necessary requisites for integration," Zapatero added; before remarking that "Turkey’s entrance is good both for Turkey and for the EU." In November 2009 Greek President Karolos Papoulias stated that he would not support Turkey's accession "as long as Ankara behaves as an occupying force in Cyprus." On 4 November 2009, David Miliband, the Foreign Secretary of the United Kingdom, during a visit to Turkey underlined the UK government's support for Turkey's bid to join the European Union, saying: "I am very clear that Turkish accession to the EU is important and will be of huge benefit to both Turkey and the EU." On 27 July 2010, David Cameron, Prime Minister of the United Kingdom, during a visit to Turkey promised to "fight" for Turkey's membership of the European Union, saying he is "angry" at the slow pace of negotiations. He added that "a European Union without Turkey at its heart is not stronger but weaker... not more secure but less... not richer but poorer." On 3 July 2013, at an election rally of Christian Democrat Party in Düsseldorf, German Finance Minister Wolfgang Schäuble stated that Turkey should not join the European Union as it is not part of Europe. In 2013, Czech Republic Prime Minister Petr Nečas said: "We continue to believe that Turkey should be given the chance to become a full-fledged member of the European Union after it meets all accession criteria". He described Turkey as an important partner to the EU and praised the constructive role it plays in the Middle East region. In March 2016, Turkish President Recep Tayyip Erdogan said that democracy and freedom were "phrases" which had "absolutely no value" in Turkey, after calling for journalists, lawyers and politicians to be prosecuted as terrorists. In March 2017, in a speech given to supporters in the western Turkish city of Sakarya, Turkish President Recep Tayyip Erdoğan said "my dear brothers, a battle has started between the cross and the half moon", after insulting European government politicians as "Nazis" in the weeks before. The same month, he threatened that Europeans would "not be able to walk safely on the streets" if they kept up banning Turkish ministers from addressing rallies in Europe. European politicians rejected Erdoğan's comments. In the context of the Turkish constitutional referendum in April 2017, the Vice President of the European Parliament, Alexander Graf Lambsdorff, summarized the state of affairs as this: "In law Turkey is still a candidate, in fact, it is not. Nobody believes in Brussels or in Ankara for that matter that Turkey will eventually join the European Union. And that is why we say it is better to make a new start and put the relationship on a new foundation." In a TV debate in September 2017, German chancellor Angela Merkel and her challenger Martin Schulz both said that they would seek an end to Turkey's membership talks with the European Union. ^ "Negotiations status" (PDF). Retrieved 19 January 2019. ^ a b "Report for Selected Countries and Subjects". IMF World Economic Outlook Database, October 2017. 24 October 2017. Retrieved 21 February 2018. ^ "CIA World Factbook: Turkey". Central Intelligence Agency. ^ "EU-Turkey relations". European Information on Enlargement & Neighbours. EurActiv.com. 23 September 2004. Archived from the original on 6 July 2008. Retrieved 26 August 2008. ^ "Interview with European Commission President Jose Manuel Barroso on BBC Sunday AM" (PDF). European Commission. 15 October 2006. Archived (PDF) from the original on 21 November 2006. Retrieved 17 December 2006. ^ Phinnemore and İçener, David and Erhan (14 May 2016). "Never mind Brexit scaremongering – Turkey is a long way from joining the EU". blogs.lse.ac.uk. LSE. Retrieved 14 May 2016. ^ a b "Erdogan warns Europeans 'will not walk safely' if attitude persists, as row carries on". Reuters. 22 March 2017. ^ a b "New clashes likely between Turkey, Europe". Al-Monitor. 23 June 2017. ^ a b "EU Council issues strong message about Turkey's obligations". Cyprus Mail. 26 June 2018. ^ a b "EU will Zollunion mit der Türkei nicht ausbauen" (in German). Die Zeit. 27 June 2018. ^ a b c d "Turkey and EU". Embassy of the Republic of Turkey (Washington, DC). Archived from the original on 27 September 2007. Retrieved 4 July 2007. ^ "Turkey and the Council of Europe". Council of Europe. 27 October 2006. Archived from the original on 7 December 2006. Retrieved 30 October 2006. ^ "Greece and Turkey accede to the North Atlantic Treaty Organization". NATO Media Library. NATO. 18 February 1952. Archived from the original on 1 November 2006. Retrieved 30 October 2006. ^ Ahıska, Meltem (2003) “Occidentalism: The Historical Fantasy of the Modern” South Atlantic Quarterly 102/2-3, Spring-Summer 2003 (Special Issue on Turkey: “Relocating the Fault Lines. Turkey Beyond the East-West Divide”), pp. 351–379. ^ "About Turkey and the EU". Embassy of the Republic of Turkey in London. Archived from the original on 27 September 2007. Retrieved 4 July 2007. ^ a b "European Council: EU would open accession negotiations with Turkey" (PDF). Retrieved 5 September 2017. ^ "Independent Commission on Turkey". Archived from the original on 9 January 2016. Retrieved 7 June 2015. ^ "Cyprus threatens to block EU deal on Turkey talks". Retrieved 7 June 2015. ^ a b c d "The ins and outs: The EU's most effective foreign-policy instrument has been enlargement. But how far can it go?". The Economist. 17 March 2007. Retrieved 4 July 2007. ^ "EU freezes talks on Turkey membership". 12 December 2006. Retrieved 5 September 2017. ^ "Cyprus won't open EU accession chapters for Turkey". Retrieved 7 June 2015. ^ "Fule urges Turkey to implement Additional Protocol". Retrieved 7 June 2015. ^ "Turkey tells EU it may postpone competition chapter if needed". TodaysZaman. Archived from the original on 15 July 2015. Retrieved 7 June 2015. ^ "Turkey sees bleak future for EU accession talks in 2012". TodaysZaman. Archived from the original on 15 July 2015. Retrieved 7 June 2015. ^ "Turkey: EU political benchmarks 'were never given to us'". eurActiv. 7 February 2013. Retrieved 9 February 2013. ^ "EU Commissioner Fule: Positive Agenda to put EU process back on track". Anadolu Agency. Retrieved 5 September 2017. ^ a b c d "Turkey-EU Relations". Republic of Turkey Ministry of Foreign Affairs. Retrieved 7 June 2015. ^ "Bağış: 'Dört fasılda kapanış kriterlerini yerine getirdiğimizin teyidini aldık'". Archived from the original on 11 January 2014. Retrieved 7 June 2015. ^ Kubosova, Lucia (30 March 2007). "Turkey targets 2013 for EU legal compliance". EUobserver. Retrieved 26 August 2008. ^ Kubosova, Lucia (17 April 2007). "Brussels declines to endorse 2013 date for Turkey's EU entry". EUobserver. Retrieved 26 August 2008. ^ "Interview with European Commission President Jose Manuel Barroso on BBC Sunday AM" (PDF). Retrieved 13 April 2007. ^ Coskun, Orhan; Hudson, Alexandra (31 October 2012). "Merkel reassures Turkey on EU talks, Erdogan raps Cyprus". Reuters. Retrieved 4 November 2012. ^ "Gül: 'Biz de AB üyeliğini referanduma götüreceğiz'". Archived from the original on 15 July 2015. Retrieved 7 June 2015. ^ a b c Dombey, Daniel, James Fontanella-Khan, and Quentin Peel (21 June 2013). "Germany blocks Turkey's bid to join EU". Financial Times. Retrieved 21 June 2013. ^ "New Eurobarometer poll results show a drop in Turkish support for the EU". Hürriyet. Retrieved 23 September 2013. ^ "Turkey welcomes new chapter in EU talks, wants more progress". Today's Zaman. 5 November 2011. Archived from the original on 9 November 2013. Retrieved 10 November 2013. ^ "Turkey could put EU talks to a referendum next year: Erdogan". Reuters. 14 November 2016. Retrieved 22 November 2016. ^ "Euro MPs vote to freeze Turkey EU membership talks". BBC. 24 November 2016. Retrieved 24 November 2016. ^ "EU says won't expand Turkey membership talks". Yahoo. 13 December 2016. ^ Marc Pierini (12 December 2016). "Turkey's Impending Estrangement From the West". Carnegie Europe. ^ "Turkey's EU bid in jeopardy after Council of Europe vote". Euractiv. 25 April 2017. ^ "EU plans to cut financial assistance to Turkey". Ahval. 6 May 2018. ^ "ENLARGEMENT AND STABILISATION AND ASSOCIATION PROCESS Council conclusions" (PDF). Council of the European Union. 26 June 2018. ^ "Turkey condemns European parliament committee call to suspend..." Reuters. 21 February 2019. Retrieved 21 February 2019. ^ "Turkey Faces Crucial Vote on EU Accession Before Local Ballot". www.bloomberg.com. Retrieved 21 February 2019. ^ Perring, Rebecca (21 February 2019). "'Change it now!' Turkey FURIOUS as EU votes to STOP accession talks". Express.co.uk. Retrieved 21 February 2019. ^ EU resumes Turkey accession talks, BBC News, 29 March 2007. Retrieved 29 March 2007. ^ EU-Turkey to restart entry talks Archived 11 January 2009 at the Wayback Machine, EUPolitix.com, 29 March 2007. Retrieved 29 March 2007. ^ Turkish Entry Into Europe Slowed by Sarkozy Move, The New York Times, 25 June 2007. Retrieved 25 June 2007. ^ Defying France, EU opens two more chapters for accession Archived 21 December 2007 at the Wayback Machine, Zaman, 20 December 2007. Retrieved 20 December 2007. ^ "europa-eu-un.org". Archived from the original on 22 December 2015. Retrieved 7 June 2015. ^ "Future enlargements – Policy – Homepage – Foreign Affairs, Foreign Trade and Development Cooperation". Archived from the original on 8 July 2012. Retrieved 5 September 2017. ^ "Turkey takes small step forward in EU membership talks". Retrieved 7 June 2015. ^ "Cyprus fails to block EU step for Turkey". Retrieved 7 June 2015. ^ "Turkey to freeze EU ties if Cyprus gets EU presidency". Reuters. 18 September 2011. ^ "Ve Fransa ilk adımı attı". HÜRRİYET – TÜRKİYE'NİN AÇILIŞ SAYFASI. Retrieved 7 June 2015. ^ "Fransa'dan 'Fasıl' sürprizi". ZAMAN. 12 February 2013. Archived from the original on 22 December 2015. Retrieved 7 June 2015. ^ "France to assist Turkey in opening EU chapter – EUROPE". Retrieved 7 June 2015. ^ "Müzakerelerde 2.5 yıllık tıkanma sona eriyor: Fransa, 22. fasıldaki blokajı kaldıracak". Archived from the original on 24 September 2015. Retrieved 7 June 2015. ^ "EU delays Turkey membership talks after German pressure". BBC. 25 June 2013. Retrieved 25 June 2013. ^ "European Commission - PRESS RELEASES - Press release - Commission Visa Progress Report: Turkey makes progress towards visa liberalisation". europa.eu. Retrieved 5 September 2017. ^ "Turkey expects new talks on its EU bid next month". Retrieved 27 November 2015. ^ "New EU chapter promises regional development in Turkey". Archived from the original on 5 November 2013. Retrieved 5 November 2013. ^ "EU-Turkey membership talks in Brussels". Retrieved 5 November 2013. ^ "EU, Turkey restart membership talks". Retrieved 5 November 2013. ^ "Accession conference with Turkey: Talks opened on Chapter 33 - Financial and budgetary provisions". Retrieved 30 June 2016. ^ including anti-discrimination and equal opportunities for women and men. ^ "Turkey - financial assistance under IPA II". European Commission. 6 December 2016. Retrieved 23 April 2017. ^ "Turkey received €1bn in EU money to develop democracy". EU Observer. 20 June 2017. ^ "Where did all the money from the EU to Turkey go?". Hurriyet Daily News. 4 July 2017. ^ "International". Christlich Demokratische Union Deutschlands. Retrieved 7 June 2015. ^ "Page not found". The Economist. Retrieved 5 September 2017. ^ "Van Rompuy: 'Turkey will never be part of Europe'". Retrieved 7 June 2015. ^ "Turkish Airlines: International Flight Destinations". Turkish Airlines. Archived from the original on 19 May 2016. Retrieved 13 December 2015. ^ Reva Bhalla, Lauren Goodrich and Peter Zeihan. "Turkey and Russia on the Rise" Archived 26 November 2010 at WebCite. Stratfor, 17 March 2009. ^ George Friedman. Stratfor: "The Geopolitics of Turkey". Stratfor, Archived 10 October 2009 at the Portuguese Web Archive 31 July 2007. ^ Öymen, Onur (29 June 1999). "Turkey". My Country & NATO. NATO. Archived from the original on 9 June 2008. Retrieved 26 August 2008. ^ "Growing worries in the West over the risk of losing Turkey". Economist: Turkey, America and Europe. 28 September 2006. Retrieved 18 May 2013. ^ Ekman, Ivar (11 December 2006). "Top Swedish official backs Turkey for EU". International Herald Tribune. Retrieved 3 July 2007. ^ "Polish president 'very optimistic' about Turkey's EU accession bid". TodaysZaman. Archived from the original on 2 April 2015. Retrieved 7 June 2015. ^ "ECONOMY – Turkey's EU bid hurt by turmoil – Polish president". Retrieved 7 June 2015. ^ "Boris Johnson says Britain will now help Turkey join EU". ^ "Turkey has no place in EU: Sarkozy". Retrieved 13 April 2007. ^ "PressTV". www.presstv.ir. Retrieved 5 September 2017. ^ "Germany's Merkel Opposed to Turkey's Full EU Membership". English pravda.ru. Retrieved 7 June 2015. ^ Islam is the religion of 5% to 10% of French citizens; see for instance Molly Moore, "In France, Prisons Filled With Muslims", The Washington Post (29 April 2008), retrieved 29 March 2018. ^ "French Parliament strikes blow to Turkish EU bid". EurActiv – EU News & policy debates, across languages. Retrieved 7 June 2015. ^ "WordPress.com". Archived from the original on 10 October 2008. Retrieved 5 September 2017. ^ Kubilay Yado Arin: The AKP's Foreign Policy. Turkey's Reorientation from the West to the East? Wissenschaftlicher Verlag Berlin, Berlin 2013, pp. 57–84. ^ "Turkey". International Monetary Fund. Retrieved 3 November 2016. ^ The World Bank: World Development Indicators Database. Gross Domestic Product 2013. Last revised on 22 September 2014. ^ Kaminski, Bartolomiej; Ng, Francis (1 May 2006). "Turkey's evolving trade integration into Pan-European markets" (PDF). World Bank. Archived from the original (PDF) on 14 June 2007. Retrieved 27 December 2006. ^ a b "The World Factbook". Retrieved 7 June 2015. ^ "2006–2007 Seçilmiş Ülkeler İstatistikleri" (in Turkish). Gümrükler Genel Müdürlüğü. Archived from the original on 8 February 2008. Retrieved 12 March 2008. ^ "Turkey puts 2008 export target at 125 bln dollars". Xinhua. People's Daily Online. 2 January 2008. Retrieved 2 January 2008. ^ "Forbes Top 10 Billionaire Cities – Moscow Beats New York Again". Forbes. 14 March 2013. Retrieved 26 December 2014. ^ "Turkey unhappy at EU talks delay". BBC News. 26 June 2007. Archived from the original on 16 July 2007. Retrieved 3 July 2007. ^ "Turkey becomes EU's fifth-largest trade partner – World Bulletin". World Bulletin. Retrieved 19 February 2016. ^ "Turkey at a glance" (PDF). World Bank. 13 August 2006. Archived from the original (PDF) on 10 December 2006. Retrieved 10 December 2006. ^ "Turkey – Population and Demographics". Intute. July 2006. Retrieved 10 December 2006. ^ a b "The awkward partners". The Economist. Retrieved 7 June 2015. ^ Mallinson, William (30 June 2005). Cyprus: A Modern History. I. B. Tauris. p. 80. ISBN 978-1-85043-580-8. ^ "Greece calls on Turkey to pull out of Cyprus". London: Daily Telegraph. 9 September 2010. ^ "ABHaber". Archived from the original on 16 April 2013. Retrieved 5 September 2017. ^ "BBC NEWS – Europe – Analysis: EU views on Turkish bid". Retrieved 7 June 2015. ^ Panagopoulis, A. (18 December 2006). "Karamanlis Hails EU's 'Historic' Decision to Admit Bulgaria, Romania". Greek News. Retrieved 13 April 2007. ^ a b "Turkey – 2005 Progress Report" (PDF) (Press release). European Commission. 11 August 2005. Archived (PDF) from the original on 30 June 2007. Retrieved 6 July 2007. ^ O'Toole, Pam (29 October 2003). "Headscarf row goes to Turkey's roots". BBC News. Archived from the original on 28 August 2008. Retrieved 26 August 2008. ^ "Turkey". U.S. Department of State. Retrieved 7 June 2015. ^ "Turkey". International Religious Freedom Report. Bureau of Democracy, Human Rights, and Labor. U.S. State Dept. 15 September 2006. Retrieved 18 May 2013. ^ "Kosovo – Towards European integration". 6 October 2011. Retrieved 31 October 2011. ^ "Social values, Science and Technology" (PDF). Eurobarometer. June 2005. Archived from the original (PDF) on 14 January 2007. Retrieved 19 December 2006. ^ Duzel, Nese (10 October 2005). "Alevilik İslamiyet'in içinde değil". Radikal (in Turkish). Archived from the original on 28 June 2015. Retrieved 26 August 2008. ^ a b O'Toole, Pam (29 October 2003). "Headscarf row goes to Turkey's roots". BBC News. Archived from the original on 18 November 2006. Retrieved 13 December 2006. ^ "The Islamic veil across Europe". BBC News. 17 November 2006. Retrieved 13 December 2006. ^ Registrar (10 November 2005). "Leyla Şahin v. Turkey" (Press release). European Court of Human Rights. Archived from the original on 4 August 2008. Retrieved 28 February 2008. ^ "Turkey 'must admit Armenia dead'". British Broadcasting Network (BBC). 13 December 2004. Retrieved 26 March 2013. ^ "Genocide Recognition Precondition to Turkey's EU Bid, Says Euro-Parliament President". Asbarez. 18 September 2012. Retrieved 26 March 2013. ^ "European Parliament critical of slowdown in Turkey's reform process". Retrieved 7 June 2015. ^ "Spain Says No: Genocide bill rejected - Genocide - ArmeniaNow.com". Retrieved 7 June 2015. ^ "Criminal conviction for denial that the atrocities perpetrated against the Armenian people in 1915 and years after constituted genocide was unjustified". European Court of Human Rights. Retrieved 30 November 2015. ^ "Turkey police fire rubber bullets at banned Gay Pride parade". Retrieved 5 August 2016. ^ CNN, Ashley Fantz, Gul Tuysuz and Arwa Damon. "Turkish police fire pepper spray at gay pride parade". CNN. Retrieved 5 August 2016. ^ "MEPs condemn crackdown on Istanbul Pride | The European Parliament Intergroup on LGBTI Rights". www.lgbt-ep.eu. Retrieved 5 August 2016. ^ Dymond, Jonny (13 September 2005). "EU blasts Turkish author's trial". BBC News. Retrieved 6 July 2007. ^ "Turkey insult law 'may be dumped'". BBC News. 28 December 2005. Retrieved 6 July 2007. ^ "New EU warning on Turkey reforms". BBC News. 27 September 2006. Retrieved 8 July 2007. ^ a b "BBC NEWS – Europe – EU hails Turkey free speech move". Retrieved 7 June 2015. ^ "In Turkey, ultra-nationalist lawyer wins supporters as enthusiasm for the EU falls". International Herald Tribune. Associated Press. 5 September 2006. Retrieved 26 August 2008. ^ Akyol, Mustafa (26 January 2008). "The Turkish Leviathan under arrest?". Turkish Daily News. Archived from the original on 5 April 2008. Retrieved 22 April 2008. ^ Sabrina Tavernise (28 January 2008). 13 Arrested in Push to Stifle Turkish Ultranationalists Suspected in Political Killings. The New York Times. ^ Lea, Richard (28 January 2008). "'Plot to kill' Nobel laureate". Guardian: Books. London. Retrieved 18 May 2013. ^ "Women's rights in Turkey: MEPs say improvements still needed" (Press release). European Parliament. 13 February 2007. Retrieved 13 April 2007. ^ Popham, Peter (7 June 2006). "Leading Turkish writer faces jail after incurring wrath of military". Independent. London. Retrieved 13 April 2007. ^ "European Commission: Eurobarometer 66 – Public Opinion in the European Union, Sep–Oct 2006, p.223" (PDF). Retrieved 1 September 2007. ^ "European Commission: Special Eurobarometer 255 – Attitudes towards EU Enlargement., July 2006, p. 72" (PDF). Archived (PDF) from the original on 23 August 2006. Retrieved 5 September 2006. ^ "Disagreement over Turkish EU membership". Copenhagen Post. 22 October 2007. Archived from the original on 10 August 2007. Retrieved 22 October 2007. ^ "The ever lengthening road". Economist. 7 December 2006. Retrieved 4 July 2007. ^ "New Eurobarometer poll results show a drop in Turkish support for the EU". Hurriyet. Retrieved 13 April 2007. ^ "Support for EU Accession Increases in Turkey". Archived from the original on 7 October 2008. Retrieved 18 May 2013. ^ "Türkler AB'ye rağmen AB'yi istiyor". Radikal. Retrieved 18 May 2013. ^ "Turkey losing appetite for EU bid, says survey". 26 January 2013. Retrieved 18 August 2013. ^ "Transatlantic Trends – Key Findings". Transatlantic Trends. Archived from the original on 17 May 2016. Retrieved 7 June 2015. ^ "Bağış: Fransa'nın tutumunda değişimin başladığını görüyoruz". Archived from the original on 9 January 2016. Retrieved 7 June 2015. ^ Sarmadi, Dario. "Juncker and Schulz say 'no' to Turkey in last TV duel". 21/05/2014. Efficacité et Transparence des Acteurs Européens. Retrieved 26 May 2014. ^ MY FOREIGN POLICY OBJECTIVES, Official website of EU President Juncker, "When it comes to enlargement, this has been a historic success. However, Europe now needs to digest the addition of 13 Member States in the past 10 years. Our citizens need a pause from enlargement so we can consolidate what has been achieved among the 28. This is why, under my Presidency of the Commission, ongoing negotiations will of course continue, and notably the Western Balkans will need to keep a European perspective, but no further enlargement will take place over the next five years. As regards Turkey, the country is clearly far away from EU membership. A government that blocks twitter is certainly not ready for accession." ^ "Erdoğan: 'AB konusunda bir yere kadar sabredeceğiz'". Archived from the original on 15 July 2015. Retrieved 7 June 2015. ^ "Erdoğan: 'AB'nin güçsüz düşmesi geniş bir coğrafyayı olumsuz etkiler'". Archived from the original on 15 July 2015. Retrieved 7 June 2015. ^ "Merkel backs new EU talks for Turkey but has doubts". Reuters. 23 February 2013. ^ SPIEGEL ONLINE (6 November 2006). "Merkel Worried about Turkey: Situation Is "Very, Very Serious"". SPIEGEL ONLINE. Retrieved 7 June 2015. ^ a b "In shift, Merkel backs end to EU-Turkey membership talks". Reuters. 3 September 2017. ^ "Sarkozy : La France et l'Asie mineure – Turquie Européenne". Retrieved 7 June 2015. ^ "Final Progress Report for Turkey" (PDF). Retrieved 13 April 2007. ^ "EU urged to freeze Turkey talks". BBC News. 29 November 2006. Retrieved 25 August 2008. ^ a b "EUbusiness: Portugal rejects major EU debate on Turkey this year". Archived from the original on 27 August 2009. Retrieved 5 September 2017. ^ a b c "ANSAmed: ITALY-TURKEY: FRATTINI, WE STRONGLY SUPPORT EU MEMBERSHIP". Archived from the original on 27 August 2009. Retrieved 5 September 2017. ^ a b c "Italy urges EU to speed up Turkey's application". euronews. Retrieved 7 June 2015. ^ a b c d e f g h i "Sarkozy cancels Sweden visit over Turkey". Retrieved 7 June 2015. ^ "ABHaber". Archived from the original on 10 April 2013. Retrieved 5 September 2017. ^ "David Miliband is visiting Turkey on 4 and 5 November". Archived from the original on 12 November 2009. Retrieved 5 September 2017. ^ "Cameron 'anger' at slow pace of Turkish EU negotiations". BBC News. 27 July 2010. ^ "German minister's EU remarks on Turkey 'unacceptable' – EUROPE". Retrieved 7 June 2015. ^ "German finance minister says Turkey is not part of Europe". Reuters. 3 July 2013. ^ "Turkey's EU process an end in itself, says Turkish diplomat – POLITICS". Retrieved 7 June 2015. ^ "Business between Czech companies and Turkey on the rise". Retrieved 7 June 2015. ^ "President Erdogan says freedom and democracy have 'no value' in Turkey amid arrests and military crackdown". The Independent. 18 March 2016. ^ "Erdogan accuses EU of 'crusade' against Islam". Deutsche Welle. 17 March 2017. ^ "Deutsche Politiker geben Zurückhaltung gegenüber Erdogan auf". Die Welt. 28 March 2017. ^ "Turkey is no longer an EU candidate, MEP says". Euronews. Retrieved 10 April 2017. Myths and Facts about Enlargement, European Commission. Turkey: key documents, European Commission. Turkey's Chief Negotiator for the EU Egemen Bağış: "We Perceive Europe as a Union of Values"